Bet Charlotte Hornets to win UNDER 35.5 games with 888sport. Bet Los Angeles Lakers to win UNDER 48.5 games with 888sport. There’s money to be made when the top online sportsbooks overrate a team’s offseason or expect too much from a young group. That’s where we come in. And we’ve got five NBA teams that we’re not expecting to reach their over on 2018-19 win totals. If you’ve read any 2018-19 previews, you know how infatuated we are with the Sixers. We like them as a serious pick to win the East, and Joel Embiid is a legitimate MVP candidate. They bring back most of their core, and their young guys have an important year of experience under their belts. But consider that last year’s 52-win season included a wild 16-game winning streak to end the year. Prior to March they were 32-27, a 45-win season-long pace. So while the 52-win season counts, and we think they could go even deeper in the postseason than last year, they could regress in the regular season. Embiid missed 19 games, but Simmons, Robert Covington, JJ Redick and Dario Saric missed a combined 19 games. Their topline health was stellar. That’ll be tough to replicate. It’s why we think they’ll be good, but maybe not good enough to top the 54.5 win total posted by 888Sport. Give it another year. The Magic really are building something, which isn’t surprising given they’ve selected in the top 6 in five of the last six drafts; one would hope they’re acquiring talent. The good includes budding star Aaron Gordon and young, lanky athletes in Jonathan Isaac and Mo Bamba. Gordon is the oldest in that bunch at 22, and Evan Fournier is just 25 and under contract for two more years. The bad is that an NBA team will enter the season with Jerian Grant and D.J. Augustin as its point guard depth. And the bench is pretty much barren past Jonathan Simmons. Those are glaring weaknesses for as potentially talented as their frontline is. So we’re a little skeptical of them improving their win total from a year ago by six games, which they would need to do to reach the over on 888Sports’ 30.5 win total. If they can bottom out just one more time and find an elite point guard, they’ll really have something cooking. It just won’t be this year. Rest in peace, Lob City. DeAndre Jordan’s move to the Dallas Mavericks officially ends an era in Los Angeles, and likely a streak of seven winning seasons. Doc Rivers has a few core pieces at his disposal in Lou Williams, Tobias Harris and, if they can stay healthy, Avery Bradley and Danilo Gallinari. But Patrick Beverley and rookie Shai Gilgeous-Alexander aren’t exactly inspiring at the point in the short-term, and as always the Clippers will have one of the league’s weakest benches. They might be and likely will be sellers at the trade deadline in a daunting Western Conference – they have eight players who will hit free agency next year – which will only hurt that win total. It’s only a matter of time before the keys get handed to the kids. 888Sport tends to agree, pitting the Clips at just 35.5 wins. We think it’ll be even lower than that. The rebuild is on with one Los Angeles team just as another is beginning its ascent. Blasphemy, we know. The Lakers are going to be much better than they were last season because of one LeBron James. One could argue they’re dark horse favorites in the West. If your team has the league’s best player, your team has a shot. But LeBron’s teams are also chronic underachievers in the regular season, especially when it comes to over-under win totals. In his latest Cleveland stint, the Cavaliers went under their sportsbook win total each of the four years he was there. Whether it’s rest, acclimating to playing with James or midseason trades that shake up the team’s chemistry, LeBron’s teams underwhelm in the regular season. Add in all the new pieces joining James in Hollywood and you have a recipe for a wildly slow start. That will make it all the more difficult for the Lakers to reach the 48.5-win mark that 888Sport has set out for them. The 44-46 range sounds more realistic. That’s only three wins away from going over, but the safe play here is under. Is it time to blow it up in Charlotte? Back-to-back 36-win seasons, a new head coach and both Kemba Walker and Jeremy Lamb staring free agency in the face. Mitch Kupchak dumped Dwight Howard and brought back Bismack Biyombo, and they signed Tony Parker in a quiet offseason in which they didn’t get much better. They have two promising wings in Malik Monk and Miles Bridges but both feel a few years away from actually competing. 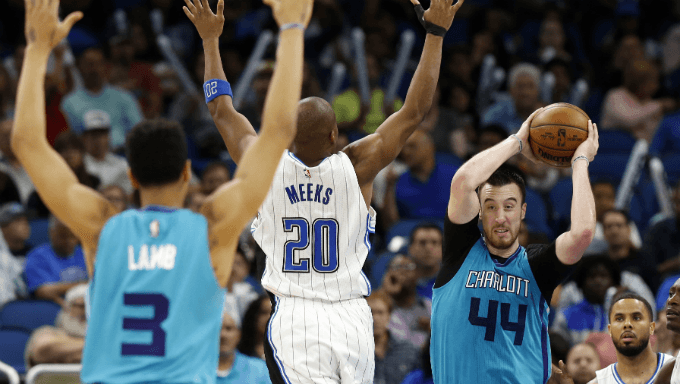 It wouldn’t be a shock to see Walker dealt at some point – rumors floated last year that he was on the trading block – or the Hornets trying to rid themselves of Nicolas Batum’s or Cody Zeller’s abhorrent contracts. This roster is a mess, and Kupchak knows it. If Charlotte gets off to a bad start to begin the year we could see a tank sooner than later. That 48-win season in 2016 feels like forever ago. Avoid the Hornets at all costs. 888Sport has them right at that same 35.5-win mark they’ve been at the last two years. We think the arrow is pointing way down. For more tips on how to pick NBA Over/Unders check out our official list of key factors to consider while betting NBA Totals.